Face it, right up there with the arrival of asteroids from deep space, we’ve been seriously due for a smiting of Greek yogurt that will not only build muscle and burn fat, but also give those who ingest it the manly fortitude to walk away from General Zod after he’s been imprisoned in an elliptical machine and gets a little pissy. Ooh-rah, people of the world who don’t skip breakfast, here’s Powerful, which you may have guessed by now is so much “more than a yogurt” that it’s brogurt: “In a niche typically dominated by female consumers,” its website tells us, “we decided to develop a new Greek yogurt specifically suited to address the unique health and nutrition needs of the most neglected consumers in the category: men.” This high-protein, no-fat, all-beast snack — spotted this weekend at Fairway and Brooklyn Fare — is going to dominate your lunchbox, beef up your sperm count, and help you pinpoint your inner abs. Ladies, be careful out there! 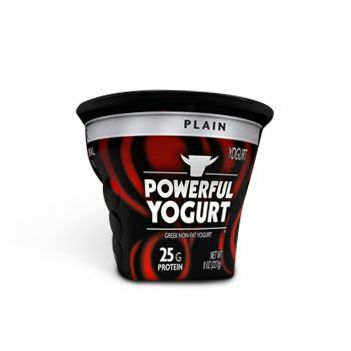 This yogurt isn’t for you!